Suitable for domestic cooking, restaurants and fast food outlets. The batter is easy to use. Simply add water for a perfect batter every time. The desired consistency can be changed by varying the amount of water. Beer or soda water may be used instead of water. Ideal for all battering needs making great seafood, banana, pineapple nuggets, dagwood dogs or use with chicken, pork or vegetables such as potato scallops. There is no need to add eggs or milk when using as a batter. You do not have to beat out lumps or let the batter stand for any length of time before use. Batter can be made up in half or smaller quantities if required. Batter has a long shelf life and keeps well. 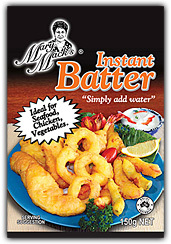 Mary Mack’s Instant Batter shortens work time required for Chinese cooking when the recipe calls for food using battered chicken or pork. Use as a food extender to make a small amount of food go further. Batter can be made as thick or thin as you like. Ideal for making all kinds of fritters and ideal for seafood, chicken, pork and vegetables. You can do all your deep and shallow frying in the one batter in the one oil. There is no transfer of taste between products; eg. you can batter and deep fry your fish, then in the same batter and in the same oil, you can make banana nuggets. There will be no transfer of taste. Can be used as a breadcrumb base, instead of having to use eggs and milk, just mix up a small quantity of Mary Mack’s Instant Batter. Alternative - use as a pancake mix where eggs and milk are added. The method of preparing food is extremely simple, requiring only moistening of the food with water, rolling in the Koating Mix or shaking in a bag. Ideal for shallow, deep frying or baking. Tasty specially formulated mixture to use on all your favourite foods such as seafood, meat, chicken, vegetables, or potato wedges. If dieting, the prepared food can be placed on a baking sheet and sprayed with cooking oil to reduce kilojoule intake. The end result is always a very pleasant enhanced flavour. 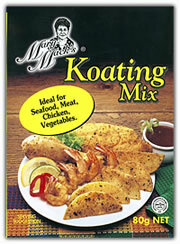 80gms Mary Mack’s Koating Mix covers approximately 2 kgs of product.